FILE - This Feb. 16, 2018, file photo released by Japan's Ministry of Defense shows what it says North Korean-flagged tanker Yu Jong 2, left, and Min Ning De You 078 lying alongside in the East China Sea performing a ship-to-ship transfer. The United States needs to target banks that facilitate illicit transactions for Pyongyang to increase sanction pressure on North Korea to the maximum, said experts. The U.N. Panel of Experts on North Korea has released a report detailing how the country evades sanctions with tactics such as illegal ship-to-ship transfers of embargoed goods and the operation of front companies abroad by North Korean government agencies. The report indicated foreign banks facilitate North Korea's financial transactions for "illegal ship-to-ship transfer of petroleum products and an increasing number of ship-to-ship coal transfers." The report said "financial sanctions remain some of the most poorly implemented and actively evaded measures." The report was released last week, in the wake of the February breakdown of the Hanoi summit between President Donald Trump and North Korean leader Kim Jong Un. The two leaders failed to agree on a denuclearization deal, with Washington refusing to accept Pyongyang's demand for comprehensive sanctions relief and Pyongyang rejecting Washington's request for full denuclearization. And while experts told VOA Korean that sanctions are working on North Korea, they suggested that tougher, more targeted sanctions, properly enforced, could be more effective in pressuring North Korea to denuclearize. Joshua Stanton, a Washington attorney who helped draft the North Korean Sanctions Enforcement Act in 2016, thinks sanctions are "not enough" and "not property targeted." He suggests the U.S. should specifically target Chinese banks that facilitate illicit transactions for North Korea. 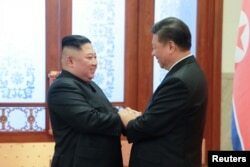 FILE - North Korean leader Kim Jong Un meets President Xi Jinping in Beijing, China, in this photo released by North Korea's Korean Central News Agency, Jan. 10, 2019. "Where we're really falling short is on pressuring the banks that hold the slush fund for North Korea's various government agencies," said Stanton. "Until we get serious about that, we will not be at maximum pressure. I will know that we have reached maximum pressure when I see the Treasury Department begin to issue really significant civil penalties against Chinese and other third-country banks." George Lopez, a former member of the U.N. Panel of Experts for monitoring and implementing U.N. sanctions on North Korea, said "[Kim] does feel the pressure, even as his evasions succeed for the moment. … This is why he insisted on removal of these U.N. sanctions at the Hanoi summit." Lopez continued, "This is maximum pronouncement of sanctions with minimal action to implement and enforce sanctions." The report noted detailed sightings in North Korea of a Rolls-Royce Phantom, Mercedes-Benz limousines and Lexus LX 570 all-wheel-drive luxury SUVs, all in violation of sanctions on luxury items, according to the U.N. report. Michael O'Hanlon, a senior fellow at the Brookings Institution, a Washington think tank, said, "The North Korean demand for comprehensive sanctions relief at the Hanoi summit suggests that Pyongyang believes the sanctions are indeed biting pretty hard." He continued, "Whether this will be enough [to induce denuclearization] is hard to say." FILE - Members of the U.N. Security Council gather for a meeting on North Korea, Sept. 27, 2018, at the United Nations in New York. 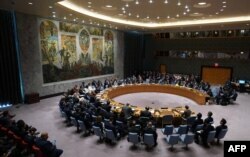 A U.N. Security Council resolution passed in 2016 bans foreign financial institutions from having correspondent relationships with North Korean banks and North Korean bank representatives from operating on the territory of U.N. member states. Stanton said Trump stopped the Treasury Department from issuing a package of designations just prior to his first summit with Kim in June 2018. William Newcomb, a former U.S. Treasury official who was on the U.N. Security Council's Panel of Experts on North Korea, said, "U.S. maximum pressure is crucially important because secondary sanctions can be used to hold violators, evaders and enablers financially and criminally accountable." According to Stanton, North Korean government agencies operate "very significant multimillion dollars' " worth of money-laundering networks, such as Glocom, using Chinese banks. The U.N. report indicates Glocom, a front company for North Korea selling sanctioned military equipment, is run by the country's Reconnaissance General Bureau agents who use "an extensive network of individuals, companies and offshore bank accounts" to conduct illicit financial activities. The report stated that a previous panel recommended that member states of the U.N. freeze bank accounts associated with Glocom. Troy Stangarone, senior director at the Korea Economic Institute, said although sanctioning Chinese banks might not be sufficient because North Korea also uses cryptocurrency digital assets to secure financial transactions, "if the United States began targeting Chinese banks that have facilitated North Korea's transactions, it would begin to close off their ability to move money." Stanton said, "The front companies and the ship-to-ship transfers are enabled by the fact that the banks aren't doing their job, and they're not doing their job because they're not afraid of enforcement." Civil penalties that can be imposed on banks that conduct illicit transactions for North Korea, according to Stanton, can be substantial, depending on whether they neglected to exercise due diligence as required by U.S. law or willfully laundered money — in which case, any assets involved in transactions can be seized and forfeited. Financial penalties can go as high as $9 billion, which was the case in 2014 for BNP Paribas, France's largest bank. It was fined for transferring billions of dollars for countries such as Sudan that were blacklisted by the U.S. 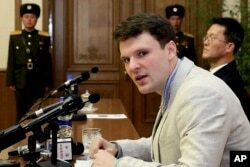 FILE - American student Otto Warmbier speaks as he is presented to reporters in Pyongyang, North Korea, Feb. 29, 2016. Earlier this month, Sen. Chris Van Hollen, a Democrat from Maryland, and Sen. Pat Toomey, a Republican from Pennsylvania, reintroduced the bipartisan Otto Warmbier Banking Restrictions Involving North Korea (BRINK) Act, named after the American college student who died shortly after he arrived in the U.S. after being detained in North Korea. The legislation calls for the U.S. to impose mandatory sanctions on foreign banks that conduct illicit financial transactions for North Korea. Lopez also emphasized that effective enforcement on illicit North Korean businesses operating abroad would prevent any banking transactions. "Banks could not facilitate the illicit monies these partnerships produce if these ventures were shut down via more effective enforcement," said Lopez. "It is the economic activities that need bank transfers that the sanctions must halt."